The Bachelor of Arts in Theater Arts program at Azusa Pacific uniquely equips students to pursue creative careers in a broad range of artistic fields including stage and arts management, writing and directing, arts education, arts ministry and technical design. Opportunities for working side by side with industry professionals and participating in prestigious internships prepare students to thrive in performing arts careers. 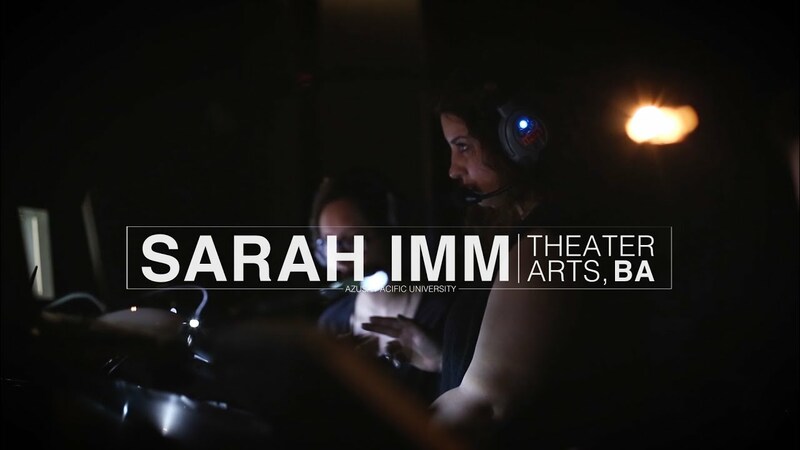 Meet theater arts major Sarah Imm, who had been performing for years but fell in love with an entirely new side of theater when she came to APU. This 39-unit degree makes it feasible for a student to double major. The department also offers an Acting for the Stage and Screen major (BFA) for students who wish to pursue professional acting careers and graduate studies in performance, as well as a Theater Arts minor. Theater arts majors at APU find many venues for practicing their craft and honing their skills, from four mainstage productions per year to internships across Los Angeles. Students’ training culminates in an event showcasing their innovation and achievement.